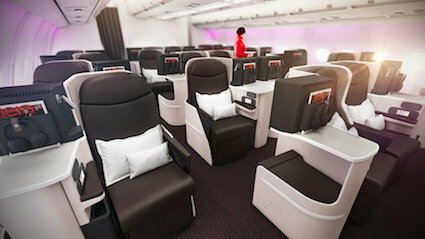 Virgin Atlantic unveiled brand new interiors for their fleet of A330-200 aircraft earlier this month. The four aircraft will be retrofitted throughout with their popular Premium cabin, along with a new look and feel for Upper Class and a refreshed look for Economy. 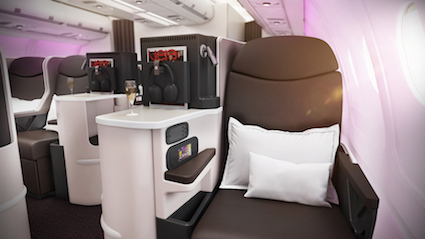 Due to roll out globally from November, customers travelling on Virgin Atlantic’s latest aircraft will be able to enjoy the full benefits of the award-winning Premium cabin. All 35 seats are set in a dedicated private cabin and offer a 38” seat pitch and a bespoke food and drink offering. Taking to the skies from November, Upper Class will enjoy a sleek new makeover, ahead of the A350’s arrival in 2019, currently in development to set another industry standard for business class travel. Exclusive to the A330-200s, all Upper Class suites will feature direct aisle access and enhanced surface area for additional personal space. The seat fabric has been entirely upholstered with natural and soft Espresso leather, underlining the cabin’s distinctive Virgin Atlantic flair. Customers can continue to choose the perfect suite – including Love Suites, Corner Suites and Freedom Suites. 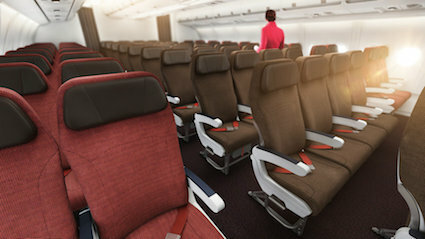 Economy will also see additional touches of Virgin’s famous style throughout the cabin. Seats will feature classic red and beige tones, along with brand new leather headrests. Each cabin will also see Black Cherry curtains and carpets, along with refreshed bathrooms, stylish mood lighting and wall finishes. Standard for Virgin Atlantic, all flights will offer high speed WiFi, power in every seat and the latest onboard entertainment. The fabulous service from the award winning cabin crew will also be on hand throughout all cabins. The A330-200s were introduced to the fleet in March to provide extra resilience in light of the global industry shortage of Trent 1000 engines, used on our 787s. Whilst the number one priority was to ensure no customer journeys were impacted, steps were immediately put in place to guarantee the full Virgin Atlantic flair would be evident in every cabin. Along with interior changes to the A330-200 aircraft, Virgin Atlantic are also making a whole plethora of enhancements to the customer experiences. Virgin Atlantic recently announced a new collaboration with premium sock manufacturer ‘Happy Socks’ to create 100,000 bespoke socks custom designed with Virgin Atlantic style. The partnership is the latest in a long line of customer experience initiatives, following recent partnerships with master pâtissière Eric Lanlard to create a Mile-High Afternoon Tea, and esteemed scent designer Rachel Vosper to design a bespoke scent ‘AIR’, used throughout the customer’s journey, with many more exciting initiatives to come.